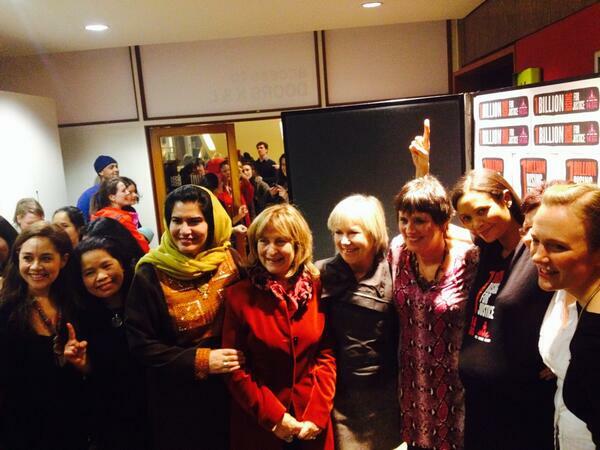 On Wednesday 8 January Rahela Sidiqi joined actress Thandie Newton, lawyer Helena Kennedy, campaigner Eve Ensler and Stella Creasy MP at the Royal Festival Hall in London to discuss justice for women. This event had been organised by One Billion Rising UK and opened to a packed and expectant audience which included Bianca Jagger, human rights activist; Skin, lead vocalist of Skunk Anansie, and Nimco Ali from Daughters of Eve. Rahela Sidiqi is a trustee of Women for Refugee Women and the chair of the London Refugee Women’s Forum. She was an activist for women’s rights for more than 15 years in Afghanistan before she was forced to seek asylum in the UK. Rahela spoke about her experiences in Afghanistan, where she stood up for women’s rights even when she was being threatened by the Taliban and warlords. She then spoke about coming to the UK to seek asylum and the injustices that are experienced by women who have to cross borders to seek safety. ‘Half of women who come here for asylum have been raped,’ she told the audience. Rahela Sidiqi also asked the panel and the audience if they would support a One Billion Rising action in solidarity with women who are detained in Yarl’s Wood on 13 February. The answer was a resounding yes – let’s rise! For more information about Women for Refugee Women’s forthcoming research, please contact Sophie Radice on sophie@refugeewomen.co.uk. For more information on the action at Yarl’s Wood, follow @4refugeewomen and @obruk_1, or check back on this blog. This entry was posted on 09/01/2014 at 3:19 PM and is filed under Uncategorized. You can subscribe via RSS 2.0 feed to this post's comments. You can comment below, or link to this permanent URL from your own site.